Cameras have recently been installed at intersections to monitor every vehicle coming into the city. Under the “automatic license plate recognition” project, once a car enters Medina, a camera captures its license-plate number. Within seconds, the number is run through a database. If a hit comes up for a felony — say, the vehicle was reported stolen or is being driven by a homicide suspect — the information is transmitted instantaneously to police, who can “leap into action,” said Police Chief Jeffrey Chen. He declined to give the number and location of all the cameras. Medina — a city of 3,100 with an average household income of $222,000 — had discussed the idea for years as a way to discourage crime, city officials said. Last year, there were 11 burglaries, Chen said. All captured information is stored for 60 days — even if nothing negative turns up, he said. That allows police to mine data if a crime occurs later, Chen said. Doug Honig, spokesman for the American Civil Liberties Union of Washington, said such a system smacks of privacy violations. It’s no secret cameras are everywhere — in stores, streets, parks and intersections where police want to cite drivers for running red lights. The city looked to nearby Hunts Point as an example. The peninsula-shaped residential community just north of Medina has been using a video-camera setup to record a continuous loop of car traffic in and out of town for more than three years, town administrator Jack McKenzie said. 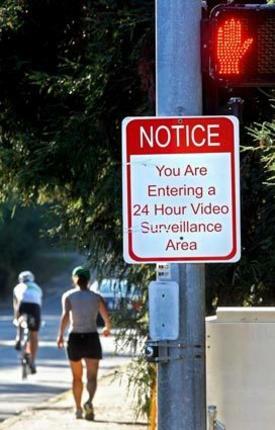 The town of about 500 residents hasn’t had a single break-in since the cameras were installed. “I recommend it highly,” McKenzie said. He said visitors to Hunts Point can’t miss the video equipment: “It’s 12 feet tall and covered with cameras,” he said of the installation, which is located at the traffic circle at the entrance to the community. There are eight cameras in all; pairs of cameras point in four directions. No residents have ever complained about it, he said. McKenzie said the town has used it for evidence in a couple of cases. In one case, he said, a woman driving a Mercedes ran into a mailbox pagoda, damaging the mailboxes and her car. Medina police — who provide Hunts Point with police protection — reviewed the tape and picked out the undamaged Mercedes going into town, and the damaged car later coming out. Medina City Council members say the cameras aren’t about preserving a gated-community atmosphere. This entry was posted on Wednesday, September 16th, 2009 at 1:37 pm	and is filed under Life in general. You can follow any responses to this entry through the RSS 2.0 feed. You can leave a response, or trackback from your own site.